NASA announced earlier this week that it will seek a new class of astronaut candidates starting in November 2011 for selection around March 2013. While the focus is on providing crewmembers to support the International Space Station (ISS), the announcement specifically mentions that the new astronauts will participate in missions "beyond low Earth orbit" too. With the Shuttle now retired and NASA's future plans somewhat in question, I think it's encouraging that NASA is advertising this class as the first to potentially take part in missions to destinations beyond the ISS in the 2020-2025 timeframe. Since that likely means field exploration on asteroid and lunar surfaces leading up to martian missions, maybe NASA will place higher importance on selecting astronauts with a geoscience background this time. Mr. Ross was also quoted at MSNBC Cosmic Log and Universe Today saying that NASA will probably select 8-12 new astronauts candidates (ASCANs) in 2013, adding to the 9 NASA astronaut ASCANs chosen in 2009 (and 24 in other countries). Requirements seem to be the same as in the 2007-2009 selection: a bachelor's degree plus three years relevant experience, vision correctable to 20/20, and probably Soyuz spacecraft anthropomorphic size constraints. However, given his mention of the MPCV and the fact that man-rated commercial crew vehicles are just a few years away, I wouldn't be surprised if the anthropomorphic requirements are more relaxed this time. What constitutes "relevant experience"? Mr. Ross added that, "the key things we'll be looking for is evidence that folks can come in and work in an operational environment... There's lots of ways you can get that experience." I'm hoping that my six years working in the operational environment of a tsunami warning center will help my chances - that, plus my recent UND degree and all of the commercial astronaut training I've been doing through Astronauts4Hire. 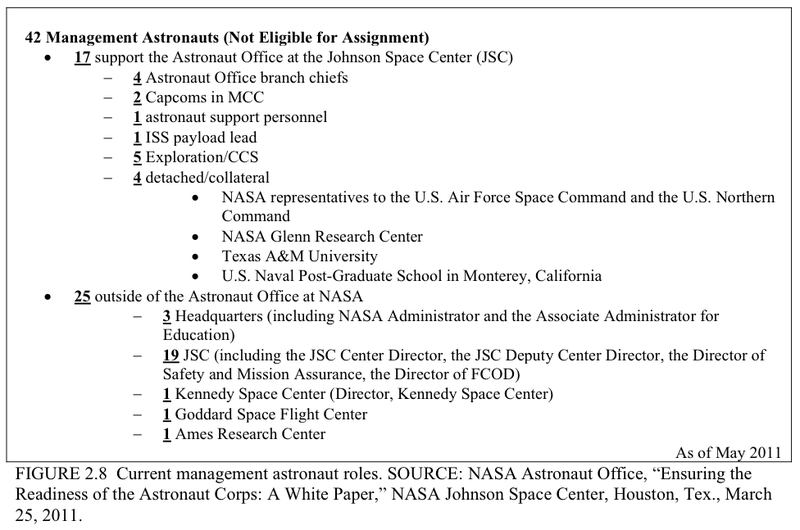 I started this blog to chronicle NASA's astronaut selection process following its 2007 announcement for the 2009 ASCAN opportunity. Now we've come full circle to another selection cycle. The new tentative 2011-2013 selection process timeline available at astronauts.nasa.gov is very similar to the 2007-2009 selection process timeline. If NASA thinks you have the right stuff, you could be deemed a Finalist by this time next year. The main question in my mind is how stiff will the competition be during this selection cycle compared with the last one. NASA's announcement comes less than a month after the National Academy of Sciences (NAS) published its 93-page report titled The Role and Training of NASA Astronauts in the Post-Shuttle Era. 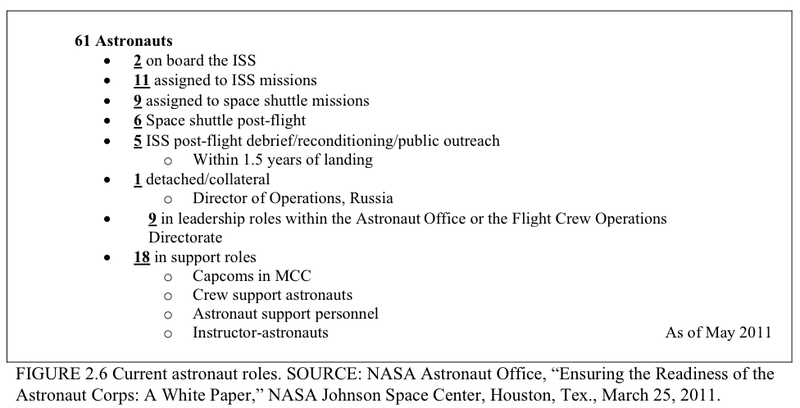 The central task given to the Committee on Human Spaceflight Crew Operations who authored the report was the question, "How many astronauts does NASA need?" They concluded that NASA does not have enough astronauts to maintain the ISS, let alone meet projected demand for new mission tasks such as exploration missions beyond low Earth orbit. They recommended an increase in the size of the astronaut corps to sufficiently maintain a mission-ready corps to operate the ISS and accommodate future needs. I had been following the progress of the NAS committee closely and took great interest when the report came out. However, I honestly didn't think the report would have such an immediate effect on NASA (or the appearance of such). Typically, NAS reports have little actual impact on agency policy and end up gathering dust on shelves. 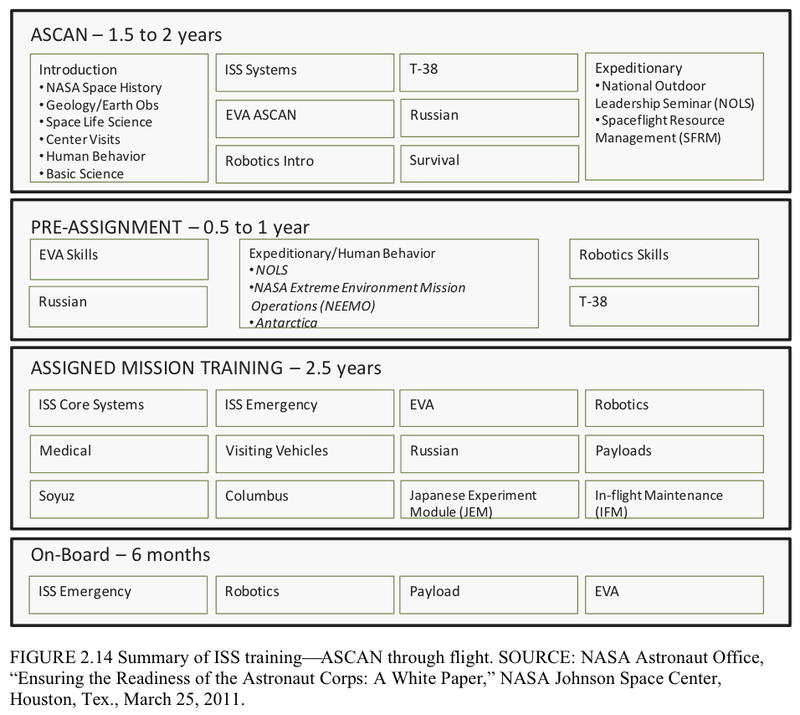 However, it seems that in this case NASA is taking the NAS recommendations very seriously and will follow up on its recommendation to steadily hire small numbers of new ASCANs over the next few years in order to bring new talent and reduce the average age of the astronaut corps (currently at 47.6). 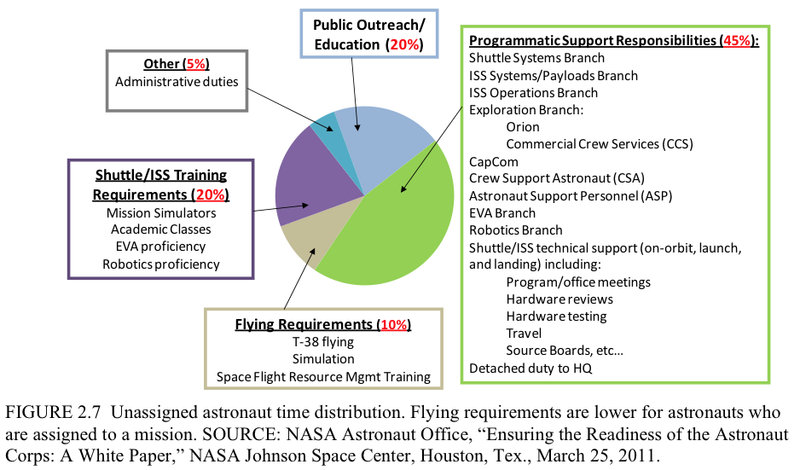 The NAS report offers glimpses into the NASA Astronaut Program that would interest any astronaut hopeful. First, it outlines the history of NASA's astronaut population, which peaked at nearly 150 people in 2000 and is projected to fall to 55 by 2016. The steady decline since 2000 was attributed to "policy decisions" on the staffing needs for the ISS. After all, NASA astronauts have been leaving in droves in recent years, presumably due to the lack of mission opportunities in the post-Shuttle era. 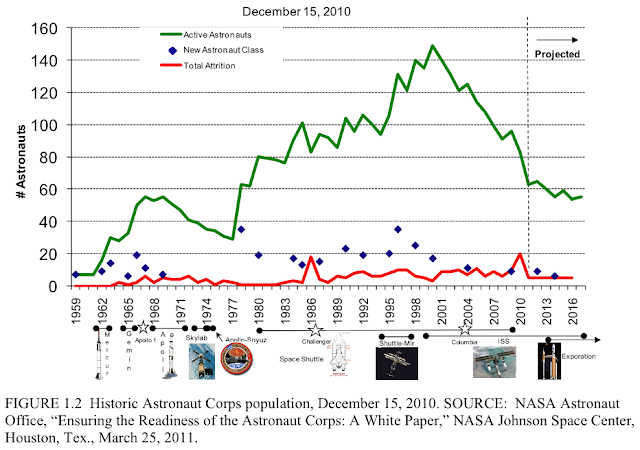 The spike in astronaut attrition rate in 2010 was equaled only by the exodus in 1986 following the Challenger disaster. As the figure below indicates, there is a second projected astronaut selection in the 2014-2015 timeframe. 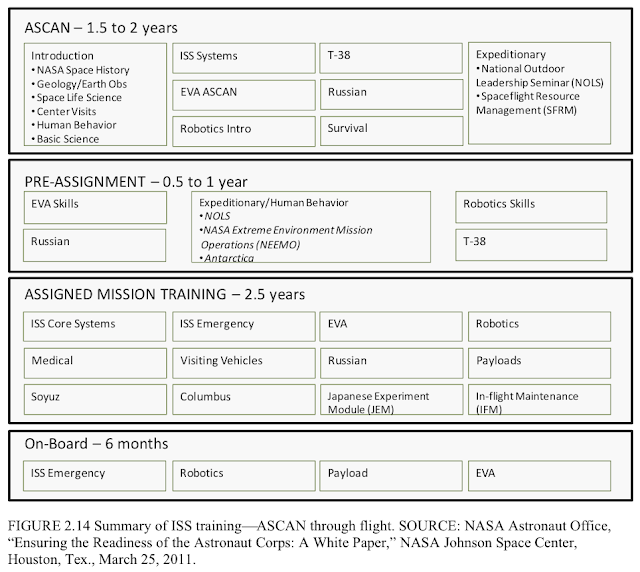 One of the conclusions drawn by the Astronaut Office for the NAS study is that it needs to hire 15 new ASCANs within the next 5 years to meet its attrition projections and staffing requirements. What does a typical astronaut do with his or her time? NASA's current 61 active astronauts and 42 management astronauts fill a number of different roles to support the program's current and future mission needs. The figures below compare the time distribution of unassigned astronauts with no mission (Fig 2.7 left) with active astronauts assigned to missions (Fig 2.12 right). 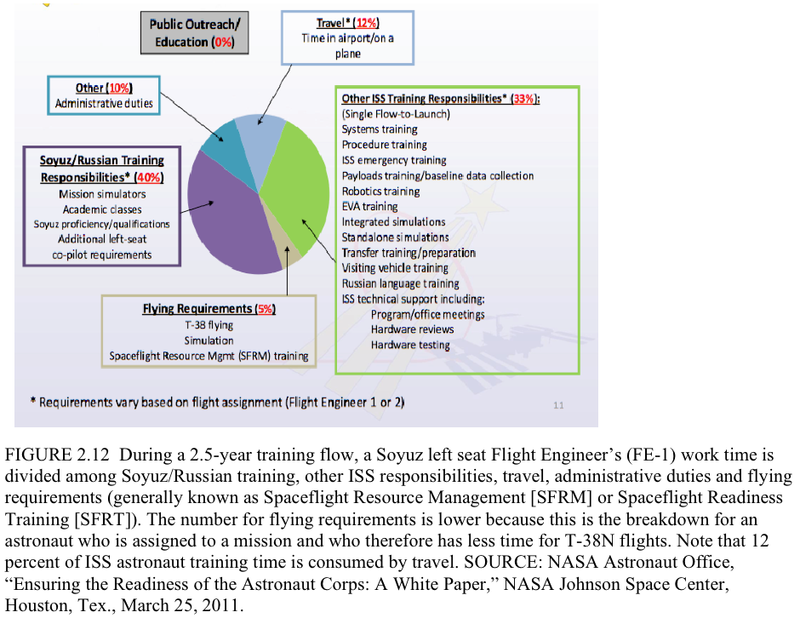 The main difference seems to be the greater emphasis on Russian systems and language training for assigned astronauts compared with unassigned ones, who have comparatively more supportive/programmatic duties. 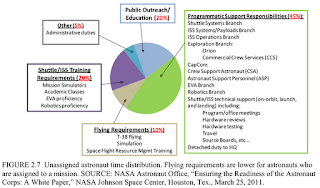 The NAS report is careful to point out that in addition to providing ISS crews, NASA astronauts also are likely to be crews for commercial crew transport vehicles, assist in the training of commercial astronauts, provide advice to commercial crew vehicle developers, and help develop/test/operate NASA's future vehicles. Such duties are likely to increase in importance over time, especially approaching the 2020 timeframe when NASA nominally plans to leave the ISS. With the Shuttle retirement and NASA's greater reliance on foreign partners, astronauts must now spend more time traveling to train in other countries and have greater language requirements. Over the course of 2 years, an ASCAN can expect to spent 49 weeks training at US facilities, 31 weeks in Russia, 7 weeks in Japan, and 2 weeks in both Europe and Canada. Duane Ross told Fox News that Russian language training is now "mandatory for America's astronauts." 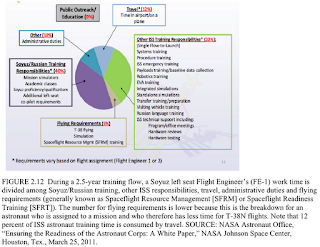 The NAS report says that astronauts must have at least "intermediate-level proficiency" in Russian. I suspect that this requirement will be relaxed over time as missions beyond the ISS grow in prevelance. Astronauts must endure 3 years of intense training to prepare for each ISS mission in addition to the 2 years of ASCAN training. The NAS report outlines the training sequence from Basic Training through Flight (see below). If you're one of the fortunate few that NASA selects, this is what you'll do for the first 5-6 years after you are selected. I knew about ASCANs participating in NEEMO and Antarctic expeditions, but I didn't know that they trained with NOLS too - an organization I have greatly admired for more than 15 years. The JIRP expedition that I completed many years ago was structured very similarly to NOLS. Even if you are fully trained and pass your aptitude tests with flying colors, you may never fly if you are medically disqualified. 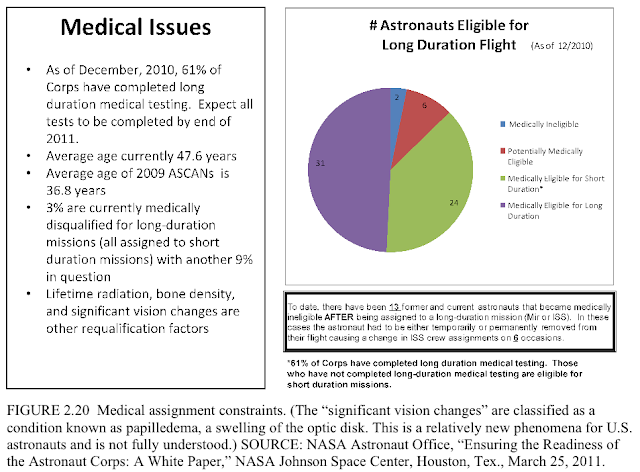 The long-duration spaceflight medial qualification criteria are very stringent in order to minimize the risk of a medical condition requiring evacuation to Earth (a leading ISS mission risk factor). According to the NAS report, 13 astronauts have become medically disqualified after being assigned for a mission before they were able to fly. A large fraction of the astronauts examined postflight have had varying degrees of medical issues such as papilledema, shoulder injuries, or radiation exposure limitations that prevented re-qualification for future flights. This underscores why the NASA astronaut corps needs a healthy margin of people beyond the minimum required in order to absorb personnel contingencies that might occur. 8 of the 63 active astronauts as of December 2010 were either medically disqualified or had that qualification in question. The report goes on to evaluate NASA's astronaut training facilities and spaceflight readiness training requirements, including the role played by NASA's T-38N trainers. The committee underscored the importance of high performance flight environments for maintaining spaceflight readiness because it places astronauts in confined stressful environments with severe consequences for failure (unlike simulators). They recommended maintaining a reduced T38N fleet with 16 aircraft by 2013. I highly recommend reading the full report yourself, or at least the executive summary. Good luck to everyone who applies to the 2011-2013 astronaut opportunity! Check here periodically for updates on both my progress and for reviews of the process itself. The selection timeline in this post has been updated to reflect NASA's timeline. The schedule slipped about two months due to the high number of applicants. The selection timeline in this post has been updated to reflect NASA's timeline. The schedule slipped about one month to give more time to select interviewees. I think you've got a great chance at getting selected this round. Good luck with everything. I hope you make it! Thanks, Sian! Good luck to you too if you apply. 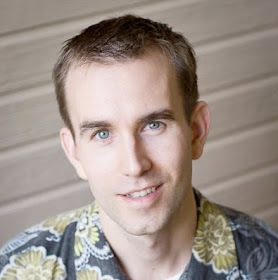 Great blog, you took your time, but a good write!